Let's be clear: we maintain no bias, all burgers are treated equally. Our reviews of what we hope to be the best burgers in NYC follow the same practical evaluation and judgment follows a three section analysis (ha, lets not get too serious here...its burgers). Yet, it's no secret, we have a soft spot for a certain type of burger. That taste bud tempting burger that combines a greasy spoon fast food style burger with secret sauce, grilled onions, melted cheese and a fresh bun gets us every time. Still, we continue to be on the lookout for a different kind of burger that will take our breath mouths away. If we're going to find something different, something new, we certainly live in the right city. When it comes to the genius that is Danny Meyer, we realize his Madison Square Park burger joint, Shake Shack, doesn't recreate the wheel with their burger. But, in yours truly's opinion, there aren't many that do it better. Plain and simple. Our Expectations: The Double ShackBurger. Two fresh steer burgers (ground daily) with meat from who else - Pat LaFrieda, American cheese, Shack Sauce (mayo-based, but all else is secret), lettuce, and tomato on a potato (yeah!) roll. Onions and pickles are optional and served on the side. All Shake Shack burgers are cooked medium, but take our word for it after plenty of experience eating at Shake Shack (we're "experts" remember? ), burgers always come between medium and medium well. Among the expectations we normally have, we also expected a serious line. Of course, most New Yorkers know about the consistent line at Shake Shack and that's why the Shake Shack website provides a "Shack Cam." Check it out for yourselves here. Either way, we also expected the usual tourist questions from passerbys: "Is the burger worth the wait?" or "How fast does this line go?" Those questions might be as consistent as the line. Meat: Lets get our first and only complaint of the ShackBurger's meat out of the way: It's a slightly tough. Not to say it doesn't taste fresh, because it is, as advertised. Yet, we wish it was cooked to temperature in a better manner. Definitely more medium well than medium. Now the seasoning, it rocks our world. Some of the best we've had...like butter. It's perfect, Brett just won't shut up about it! As for the patties, their size is to our liking. They maintain their texture throughout and aren't overwhelmed or drowned by the bun or toppings. Toppings: Some delicious stuff going on here. The toppings on the ShackBurger won't suffocate you, as some best NYC burger candidates might. The Shack Sauce drips gently over the patties, with just enough to add flavor without cramping the meat's style. The lettuce and tomato are fresh and the American cheese melts like a blanket of gooey goodness over both patties. When ordering from Shake Shack, you're doing yourself no favors by leaving off the toppings...especially the Shack Sauce. DO IT! If you're going to wait on line for an hour plus, you better get whats good, and whats good are these toppings. Bun: The perfect bun. We really shouldn't have to say more. But, our review demands more and we'd never leave our readers hanging. Shake Shack uses a glorious and fresh potato roll. From this, we've decided a potato roll or bun of some sort should be the default. Don't mess with sesame or white rolls. Leave the brioche for the heathens. Serve us a burger on a potato roll and you'll win our hearts. As for why this bun is the best, besides being made from spuds, we'd use the words soft and flavorful and tell you that its expertly toasted. We challenge you to find much better. Meat (47): Immense flavor, addictive taste. We order two at a time...check the pics. Though, it leaves us wanting more in the texture category, but that doesn't prevent our double order. Toppings (23): Shake Sauce is a must, American cheese blends well, all the rest are fresh and crunchy. Solid bunch. Bun (25): Perfection. Buttery, sweet, soft and a perfect compliment to the patty. If you’re a loyal reader of Burger Bedlam, and we hope you are (sign up for our e-mail distribution at the top left of our home page! 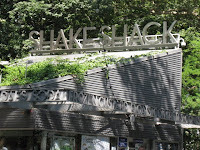 ), you wouldn’t be surprised to see us rank Shake Shack as the best NYC burger. Stemming from our long-devoted love (infatuation?) with In-N-Out Burger on the west coast, finding a burger in NYC that has all of the attributes of a Double Double Animal Style would certainly make us giddy. While we long for the day that In-N-Out Burger makes its way east (doubtful), we have, in the past, found Shake Shack to adequately fill the void. As a tourist or New Yorker alike, it is more than likely that you've been educated by many on what they deem to be the "best burger in NYC." Obviously, that's Burger Bedlam's main objective here, but you and we both know, its all subjective. We set out on our journey for burger judgment with that in mind, its a matter of opinion. Its apparent that, depending on a variety of factors, one can make the argument for or against some of the many options you have in Manhattan and the surrounding boroughs. It's probable that burger lovers in the area have more often than not mentioned J.G. Melon among the best. It's easy to see why, especially with the restaurant's devotion to grilling up fresh, thick and juicy meat. So, on a mission to digest the best, we made our way to the notorious pub on the Upper East Side, dining amongst preppies and popped collars. Our Expectations: The J.G. Melon Bacon Cheeseburger. Why go for the basic burger when they have bacon and cheese ready and waiting? Not to mention the bacon here is thick and crispy, a bacon lover's dream. Most J.G. Melon enthusiasts recommend the cheeseburger, we at Burger Bedlam say go all the way. With a thick, eight ounce patty, standard onions, lettuce and tomato, the bacon and American cheese add to this burger's "oomph" factor. Served on a soft white roll, you couldn't really get any more American than that. Me at: You want freshness from a patty? Head to J.G. Melon. The ground beef stands out as a freshly done and well-cooked heifer. Yeah, we said heifer. That's a female cow. Still, truth be told, the seasoning department has some work to do. Other burger destination's meat can claim true flavor, J.G. 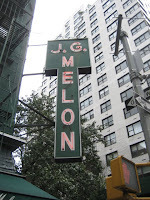 Melon is a bit of a letdown in the area. Some may argue for freshness over flavor, but then again, they don't write this blog! We value both here at Burger Bedlam, and aren't satisfied without a complete combination. Toppings: Bacon, bacon, bacon...we love bacon. And if you're looking for some serendipitous bacon, look no further. To date, we haven't found a burger joint that can provide us with better cured pork. Marry that with the perfect execution of melted American cheese and you've got a winning combination of toppings. Throw on a few pickles, some raw onion, crisp fresh lettuce and a tomato, if you so desire, and you're sittin' pretty. Bun: We've come to find that its hard to mess up the bun. Now we're not gonna go ahead and put J.G. Melon in the "failed" category, but it needs some work. A bit dry, adding nothing to the taste or texture of the burger as a whole, the bun left us high and, um, dry. If you want the crown of best NYC burger, you gotta step up your game! Meat (45): Fresh, yes. Flavorful, no. A great amount of juiciness and tender texture, but how 'bout some seasoning maestro? Toppings (22): Bacon bliss, choice cheese and fresh vegetables make us happy. We couldn't ask for a better bunch. Bun (20): Too dry and not much added value. A disappointment all around.